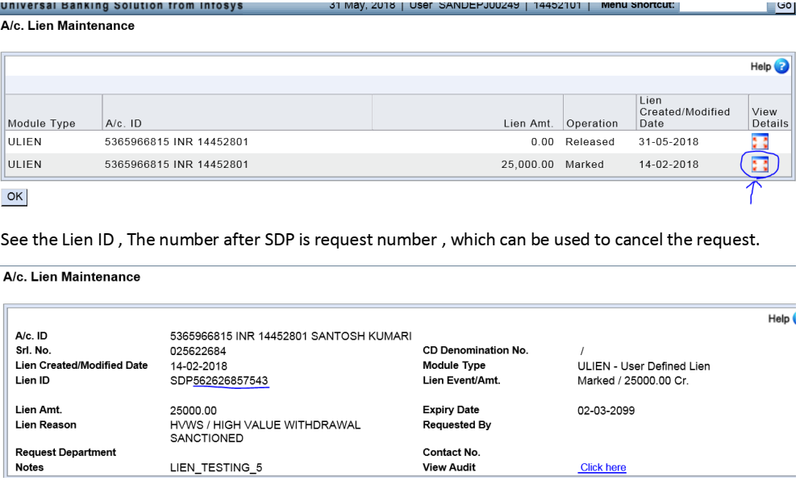 Many offices are facing problem in High value withdrawal in BO RICT Devices because after approving the request from SO is does not shows in RICT device after some days and the BPM is not able to withdraw the money, a lien is marked on that account which prevents the money to be withdrawn from that account even from SO Finacle. TO REMOVE THE LIEN THE ALREADY APPROVED RICT REQUEST WHICH IS NOT SHOWING IN RICT DEVICE HAS TO BE CANCELLED. NOW BPM CAN MAKE A NEW REQUEST IN DEVICE AND GET IT APPROVED BY SO. If request number is not known , then follow these steps.